The current market of tablet computers provides an ideal demonstration of how not to compete. That is, unless you have lots of money to spend on marketing and such – but nevertheless, it’s going to hurt your bottom line. Fundamentally, the other vendors vendors are chasing Apple. First iPad, now iPad2. Is that a winner? I think not. Research has shown clearly that when coming up against a successful incumbent, simply offering a similar product at a lower price is not going to displace the incumbent. It’s just a costly bloody battle (or as aptly named in Blue Ocean Strategy [W. Chan Kim and Renee Mauborgne, Harvard Business School press], a Red Ocean). And of course in case of Apple, providing a better product is a tricky proposition – Apple is very good at what it does – mind you this is talking about relevant user experience, not strictly technical merit (see also Working Back From Client Experience to Technology). In a nutshell, providing a better product at a lower price does not really differentiate. You’re still operating in the same market as the incumbent, and they have the home ground advantage. So what you want to do is not directly compete with the incumbent, yet take advantage of the existing market exposure. What does this mean? Clearly, tablet computing is a hot topic! You can make use of that, but not actually aim for typical iPad clients as they are well served by Apple through its funky stores, advertising and user advocacy. Leave them be. You need to differentiate, preferably in a disruptive way, and thus end up in a different market. First of all, the HP Touchpad is now dead since HP dropped WebOS (but you can run Android or regular Linux on it, no jailbreak required). HP Touchpad has very good hardware (comes at a price), WebOS has decent usability and while the WebOS’ appstore is significant, it’s not as big as Apple’s. Samsung Galaxy Tab has a similar profile, uses Android (which is not as slick as iOS – depending on whom you ask) which has plenty of apps available. obviously your brand is not known. since you don’t have a huge app store (don’t even go there, other bigger ones have failed) you essentially have only the apps you stick on it yourself; if you do use Android, you have apps available (which is why I didn’t rate it as 0). However, with lower hardware specs fewer will be useful/practical/relevant. your pricing is now simply a consequence of the other aspects. You can also work it the other way round and aim to produce a product for say half price, and in this case I’d guess the picture would end up looking fairly similar anyway. It appears that in this product, any aspect you tweak directly affects one of more others. Naturally we can debate details, but you’ll probably broadly agree with my quick assessment and the fact that some minor tweaks in the numbers won’t make the picture look significantly different. If products have a similar curve, they tend to be in the same space and thus compete for the same customers. Samsung clearly positioned itself just slightly below Apple’s pricing for essentially a very similar product. HP did the same, and then gave up (possibly a wise move, for this particular product – good though it is: I have one, which bought in the runout sale but only because it was so cheap). But both the Samsung and HP curve still look very similar to Apple. The disruptor’s curve is distinct. 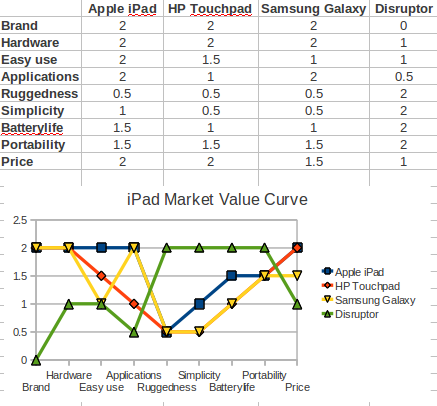 If a big brand were to produce my disruptive product, its curve would still look very different to iPad with most aspects well below – below is not bad, it means it’s different! The Disruptive Tablet is not going to get bought by the typical iPad user. But so what? We know lots of people are ogling the technology, and iPads are really expensive. So what other group of people would you aim for? Well that’s a very tricky question and my honest answer is that you won’t know beforehand, no amount of market research is going to help (so save that money). Markets tend to find products, not the other way round. And since we’re not aiming for iPad customers directly, we’re essentially aiming for non-consumers e.g. people who would currently not otherwise consider buying a tablet at this stage. If you are familiar with a potential market (say industrial logistics, or early childhood education) you could develop (or acquire) a few specific apps and aim for that market. Some suitable Android apps might already be available for your prospective market, and thus we’ve created something magical: an enabler. Enabling technology makes a type of product available to a new realm of users. Think of how 3.5″ hard disks enabled sanely portable computers (Toshiba was first there), and how compact flash memory cards enabled digital photograph (Canon IXUS/PowerShot, and many others). A cheap tablet does not need to have lots of apps, it merely needs the right apps needed by the specific market – chances are these won’t be general consumers because they’d look for more choice. Your tablet would probably not make a mobile connection but only have wifi. Forget about Bluetooth. If you use inductive charging (the HP Touchpad actually does that but only with a separate display dock) you don’t even need a usb plug – now that may appear trivial, but a sturdy mechanical connector is expensive and when used in either industrial or kiddie environments, it’s a hindrance. So get rid of it altogether. For industrial use speakers won’t be necessary, but a camera on the back could be useful for barcode scanning and other applications. For kiddie user, both camera and speakers are probably required but again that depends. Making technology appear simple is hard! As you see, stripping features others now regard as essential assets can actually be a good thing – whereas most people think in terms of adding things, actually focusing the other way: removing things, this suddenly makes the product viable for new markets, and at a lower cost. Apart from now scoring high in the simplicity aspect (something the others would have to put a lot of work in to with their user interface), the simplicity also enables the ruggedness asset: you have fewer connectors and buttons (for a good ruggedness-test of a tablet, I’d toss some sugary liquid over it, and drop it on the floor – this mimics both industrial and kiddie environments!). How about no physical buttons? Example: The HTC Incredible S phone doesn’t have buttons on the front, it merely uses the bottom end of its touch screen for 4 buttons. It makes the phone simpler and reduces the number of mechanical bits that can break. Good! Considering the high price of the iPad, even half-price may not be sufficiently cheap to reach some markets. A $100 tablet would have special potential. Obviously some people in the new market will have bought an iPad in the past – it might do the job but it’s overspecced and (for the job) overpriced. Don’t worry about that, it’s actually a typical feature of a disruptive market. When looking at replacing or extending, your offer will make much more sense. Essentially you will have the market to yourself (Blue Ocean), while also taking some of the low-end clients away from iPad and similar offerings. That’s makes it extra fun! The product will have a limited lifetime, as prices overall come down. So be it. Enjoy it while you can and be smart about it. Work on other things. Generally, disruptors tend to “float upward” by chasing “higher value clients” (sales people on commission tend to cause that) and adding features. You may indeed want to add some features as your clients become more sophisticated in their own needs and the tech becomes even cheaper. But resist the temptation to equal the others’ features! Remember that “Upward” is where the nasty Red Ocean lies, it’s not a winner at all. Stay where you are and do it well. Go sideways – find other similar markets that are still untapped. Use the acquired expertise to do something completely different again, and start a new separate business for that.